The following is a guest post by Andrew Galasetti. Despite the ease of independent publishing today and the amazing success stories of indie authors that continue to appear, the choice to self-publish should not be a quick decision. In 2008, when I seriously set out on writing and publishing my first book, independent e-publishing was still young. I pursued the traditional route of finding a literary agent and then a publisher. But I wasn’t blind to how indie publishing and e-reading devices were developing. Then a few years later, the stories of indie authors like Amanda Hocking and John Locke emerged. And, like every other writer, I paused and listened closely. I then evaluated whether self-publishing was the right path for me. I felt in my gut that it wasn’t. So I continued on the traditional route. The stories about indie authors finding success through e-publishing continued to accumulate. The iPad debuted. More advanced Kindles were released. And indie e-publishing was growing up fast. I stopped fully this time and asked myself some serious questions about whether I should now pursue the independent route. The questions weren’t only about whether or not I would make more money. They required deep thought. Self-reflection is important for the business AND, more importantly, the soul of self-publishing. With my answers to these questions satisfying, I set out to independently publish my upcoming novel To Breathe Free. If you are an author still considering whether to self-publish or not, I would like to share the questions that I asked myself. 1. How will my readers benefit? Always in your initial thoughts should be your readers. How will your choice to self-publish benefit them? Consider cost, convenience, and the connection they will have with you and other readers. For me, I was very concerned about cost. $25 for a new novel always seemed like a steep price and was something that prevented me from reading more new authors. I wanted a way that I could provide my readers with a substantially lower price. Independent e-publishing was the answer. And if I could e-publish on multiple platforms and provide readers with a DRM-free book, then they would enjoy convenience. Independent e-publishing allowed me to do both. And with indie publishing, I saw a way to cultivate a closer connection with readers. The intimacy that indie publishing provides doesn’t elevate authors on to an untouchable pedestal. Instead, it keeps authors level with readers, the way it should be. 2. Do I mind the long wait for traditional publishing? One of the biggest complaints about traditional publishing is that, unless you’re a hot and timely personality, it takes at least a year from signing a contract until your book is published. And that doesn’t include the time it takes to find a literary agent or, if you’re working on fiction, the time it takes to write your manuscript before approaching an agent. 3. If so, is it because I’m impatient? There’s a difference between being impatient and being driven. 4. If so, will my impatience negatively impact the quality of my writing? The speed at which authors can now self-publish their books is amazing and has numerous benefits. But it also increases the chance that an author will publish a manuscript before it is ready. Taking your time is still crucial to crafting a wonderful book. 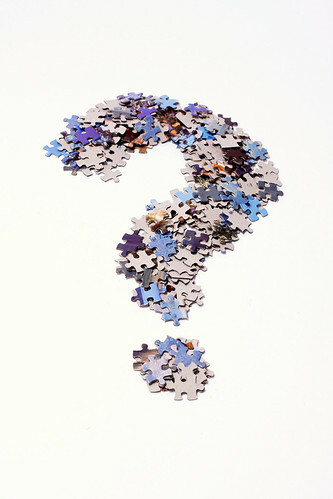 If you are impatient, self-publishing offers a quick fix. I feel I’m driven and also willing to take time to ensure the greatest quality for my readers, but I still enjoy the speed of e-publishing. Balance is the key. 5. What skills do I possess? When you self-publish, you need to do almost everything required to write, publish, and promote a book. To self-publish means to be an entrepreneur. However, it is also important to remember that even traditionally published authors need to be entrepreneurs to complete in the evolving publishing world. I have been an entrepreneur since I was 14 years old, launching a variety of ventures, so I knew that I had experience that could translate to successful self-publishing. 6. What skills can I outsource? For my novel, I had many skills, but still needed to outsource editing. I feel that it is important to have a person with an impartial view to push your writing and manuscript further forward. 7. How will I outsource these skills? Do you know a friend who can help provide you with one of the skills you need? Can you barter? Do you have the funds to hire freelancers? If you don’t, can you raise the funds in some way? For my novel, the hiring of a freelance editor was going to be my most substantial expense. So, to help offset the cost, I looked for ways to raise funding, turning to the largest crowd-funding site, Kickstarter. 8. How bad do I want it? Writing and publishing a book, whether traditionally or independently, is an ambitious endeavor that requires determination, creativity, talent, know-how, practice, physical and mental strength, and other skills, traits, and mindsets. But there is another element, something that can’t really be defined, which sets indie publishing apart from the traditional route. This question, and what it reminds me of, is all I needed to confirm my choice to self-publish and all I need to keep me pushing forward when things become challenging. It’s because To Breathe Free isn’t just for readers or for me, but for my late Grandfather. Almost a year and a half ago, my Grandfather passed away, and with him, literary dreams could have perished. My Grandfather was a creative man with a passion and talent for writing. 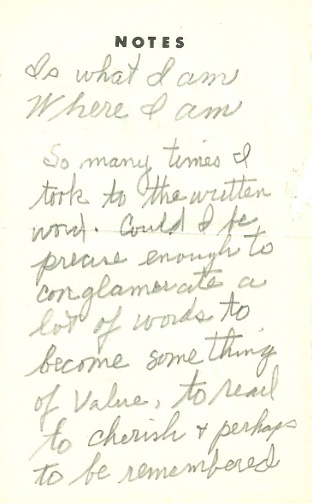 However, I did not know this until after he was gone and my family stumbled across poems he had written decades ago. My Grandfather never was able to publish any of his writing. I knew that, with his death, his literary dreams were in threat of dying. I decided moments after reading “Is what I am Where I am” that I would achieve my Grandfather’s dreams for him. And, to do so, I would publish a selection of his poems, including “Is what I am Where I am” in the foreword of To Breathe Free and weave them in to the novel’s story. When I ask myself: “How bad do you want it?” I remember what I’m doing for my Grandfather. Any obstacle that self-publishing puts in front of me is no match for the intense fire burning within me. 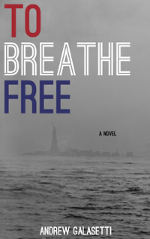 Andrew Galasetti is the author of the upcoming novel To Breathe Free. To Breathe Free follows a young narrator traveling through Manhattan and his family’s past, where family members struggle for the American Dream against poverty, abandonment, fate, time, and death. To Breathe Free will be published Fall 2012 exclusively in digital format on major e-reading platforms including Kindle, Nook, iBooks, and Kobo. He is currently running a Kickstarter campaign until July 19th to raise funds to hire a professional editor and achieve his late Grandfather’s literary dreams. To join the journey and to pre-order To Breathe Free for $4, please visit his website here: www.tobreathefree.com. Love this. Great questions and indicators of motivation and desire. Thank you. I’m so glad you enjoyed it Teri Lynne! Thank you for the compliments. Thank you Toni and Shannon for letting me guest blog. I really enjoyed writing this and I hope your readers enjoy it as well. Thank you! I would love to come back and blog again. Great article! Definitely questions worth asking before making the decision to self publish. I always wonder what people are thinking when they tell me “Self publishing is EASY. You should just do it!” There’s a lot to think about, and these questions point me in the right direction. Thanks! Hi Amy – Thank you for the compliments! I’m so glad that this post is going to help you out. Best wishes with whatever publishing route you decide on! The book thing for me, though, is the freedom. If all goes according to plan, I love the idea of doing special hardbacks, limited edition gifts and anything I want to do. Yes, the FREEDOM is one of the top reasons to pursue the indie route. Of course, the freedom means all the aspects of publishing and promoting are up to you, but I feel it is well worth it. And like you, I actually enjoying the business aspects like promotion. You wouldn’t believe how timely this is for me, and how the questions clarified what I’ve been thinking. I’m going to pass on the link to the authors in my writers’ circle. I think they’ll appreciate it as much as me. Thanks, and best of luck with ‘To Breathe Free.’ It’s wonderful that you are sharing your grandfather’s poetic words with the world. Thank you, Cathy! I’m glad my post helped you think through things with more clarity. Self-publishing is not an easy decision to make. I appreciate you sharing the link with fellow writers. I hope it will help some others. And lastly, thank you for your kind words regarding TO BREATHE FREE and my grandfather’s writing. The project is continuing to move forward and I’m thrilled.